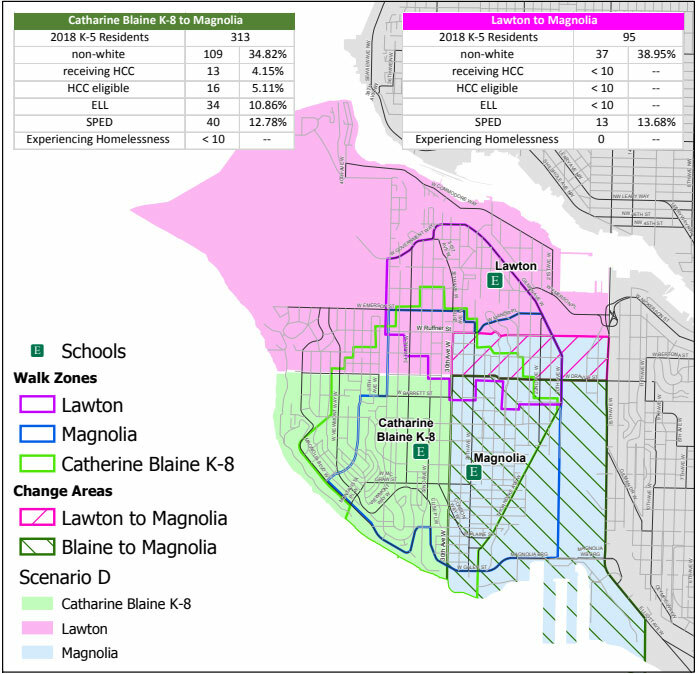 Map courtesy of SPS: The Seattle Public Schools Board of Directors chose to make Option D the new Magnolia School boundaries once Magnolia Elementary School opens for the 2019-20 school year. After months of meetings, public forums and inner-district talks, the Seattle Public Schools Board of Directors approved new school boundaries for Magnolia students and approved new transportation service standards last month. Multiple boundary maps were presented to parents, teachers and school leaders before the board’s decision. During the Jan. 9 public board meeting, SPS staff recommended the school board approve Magnolia boundary Scenario C, but the School Board Operations Committee recommended Magnolia boundary Scenario D.
In Scenario C, the Catharine Blaine K-8 boundaries would be the smallest in the area. The Magnolia boundary takes up the eastern portion of the Catharine Blaine boundary while taking a larger chunk of Lawton’s southeast portion of its boundary. Catharine Blaine would not expand into Lawton. Scenario D was similar to Scenario C, except the Magnolia boundary takes up less of the Lawton boundaries. That means Catharine Blaine would have more room for middle school choice enrollment, but Lawton would be near capacity, with no room for growth. District 5 board member Zachary DeWolf motioned to move forward with Scenario D and to grandfather siblings of current fourth-grade students at Lawton and to grandfather in siblings of current fourth- through seventh-grade students at Catharine Blaine. The board approved the new boundaries and the amendment to grandfather in certain Catharine Blaine and Lawton students unanimously. During the Jan. 23 meeting, District 4 board member Eden Mack amended a proposed transportation services standards resolution to help ease the transition for students affected by the Magnolia boundary changes. The adoption of the Transportation Service Standards is an annual action by the board of directors, and it includes setting arrival and departure times for school. After board action, the superintendent sets start and end times for school days. Changes from the 2018-19 year to the 2019-20 school year included adding Lincoln High School and Magnolia Elementary to the transportation routes. Mack asked for two amendments to the resolution. Mack’s first amendment passed with a 4-2 vote by the board, but the second amendment to the resolution failed. The historic Magnolia Elementary School is expected to reopen this fall, freeing up space at Lawton Elementary and Catharine Blaine K-8 schools. SPS architect Floyd A. Naramore designed Magnolia School, which opened on 28th Avenue West in 1927 for grades 1-6. The school expanded to grades 7-8 and had several build-outs between 1931 and 1969. Catharine Blaine Junior High School was built in 1952 to address overcrowding at Magnolia School, which later dropped to just grades 1-3. The school was closed in 1984, and later became an interim site for other schools as they underwent renovations. It was closed entirely in 2002. The school district is now renovating and modernizing Magnolia Elementary, plus adding four classrooms and a gymnasium, in order to accommodate an increase in the student population in Magnolia and Queen Anne. The project also helps SPS comply with the McCleary decision regarding reducing class size. Once open, Magnolia Elementary is expected to accommodate 500 students. Originally, the school was expected to open in fall 2018, but higher than expected construction bids were rejected in 2017, and the project was rebid that fall. The project cost is $26.2 million, and Forma Construction Company is the contractor. Funding comes from the Building Excellence IV levy. Queen Anne Elementary head teacher Katie Cryan Leary was tapped by SPS to serve as Magnolia Elementary principal back in April.